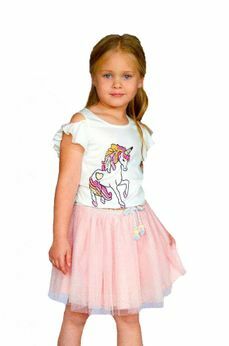 It just doesn't get much cuter than little girls all dressed up in tutus and skirts and Baby Sara Sparkly Pink Tutu Skirt ups the adorable factor even further! Your little one will love the tiny tulle tutu and braided bow details on the waist. You'll love the effortless way this adorable skirt makes a sweet outfit for any occasions. It can be worn with a matching unicorn tee for a relaxed look. Or can be paired with sequined Baby Sara bomber jacket for a fancy occasions, like church visit or family pictures. Your little princess will not want to take this off.